A Zanpakutō (斬魄刀; literally, soul-cutter sword) is the main weapon of the Shinigami, the Arrancar and theVisored. The Shinigami art of wielding a Zanpakutō is called Zanjutsu (斬術; literally, swordsmanship). The Zanpakutō of low-ranking Shinigami are called Asauchi and don’t have names, but the Zanpakutō of Shinigami of rank have names. In its sealed state, a Zanpakutō has the form of a Japanese sword. 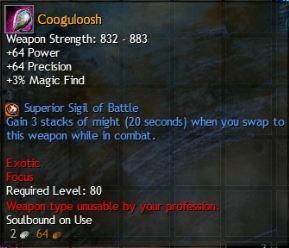 Such weapons are unique swords generated from their owners souls. Its shape differs depending on its owner. Zanpakutō are the trademark weapons of the Shinigami. 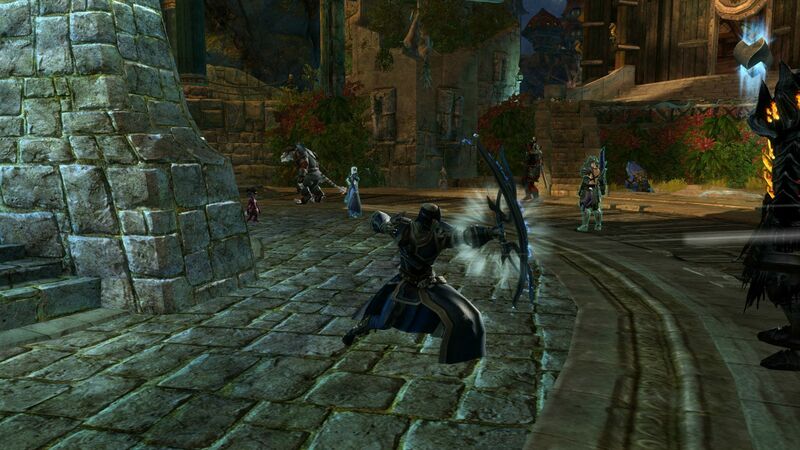 Capable of cutting spiritual bodies, they are amongst the few weapons which can be used to combat Hollows. Each Shinigami carries a Zanpakutō, and each Zanpakutō is unique: as the swords are both reflections of a Shinigami’s soul and power, and sentient beings unto themselves. The Zanpakutō’s name is also the name of the living spirit that empowers the sword and lends its strength to the Shinigami who wields it. These beings can vary greatly in appearance and have their own distinct personalities which match their owner’s. A Zanpakutō’s shape and abilities are based on their Shinigami’s soul. Once a Shinigami learns his/her sword’s name, they are able to communicate with one another and grow stronger together. Zanpakutō are born with their Shinigami and they die along with their Shinigami. Shinigami use them in battle as a reflection of their heart. When released, they can display a vibrant power. They are one with the Shinigami, and they share a Shinigami’s conviction. Inside each Zanpakuto is an incarnation that manifests itself upon the Zanpakuto’s transformation. The first step is to acquaint oneself with this incarnation. Because they are part of their owner’s soul, a Zanpakutō cannot be replaced, though it will slowly regenerate if it is broken. In order to to fix a broken Zanpakutō, the owner needs to take Reishi and Reiatsu and merge them into his/her Zanpakutō. However, this only applies if it was the Shikai which was damaged, if a Zanpakutō breaks in its Bankai state then it will never go returned to its former state. The size of the Zanpakutō reflects the amount of the swordsman’s spiritual power. Exceptions to this rule are beings of immense power who are required to actively control the size of their Zanpakutō. If a Shinigami pierces the chest of a Human with their Zanpakutō and channels their Reiryoku through it into the Human’s body, it will transform that Human into a Shinigami temporarily. The act does not have a high chance of viability even when the Human in question has a high level of spiritual energy, and if the method does fail the Human will die. Every Zanpakutō has its own name. A Zanpakutō can determine whether or not its wielder is worthy of its power. Zanpakutō have a true form. This true form resides inside their Shinigami. A Zanpakutō has a mind, and a body that controls their powers. Shinigami are able to grow more powerful by communicating with them. Zanpakutō possess their own reiatsu, which can be sensed as any reiatsu can and is identical to that of their wielder though with subtle differences. Though rare, it is not impossible for more than one soul to be attuned to the same spirit. In such cases, ancient law of the Soul Society will not allow two beings to wield the same Zanpakutō, in which case, they must duel for ownership of the spirit, with the winner gaining it and the loser being sentenced to death. No matter what form (or size) a Zanpakutō takes, it is always virtually effortless for its owner to wield because it is a part of its owner’s soul. Shinigami captains all consciously keep their Zanpakutō in a manageable size, otherwise they would be holding Zanpakutō the size of skyscrapers. Therefore, one cannot judge one’s opponent’s strength solely by the size of their Zanpakutō. A wielder knows their Zanpakutō spirit very closely and vice versa. The connection is very deep, though in the beginning the connection is one sided with the wielder being unable to fully hear the spirit communicating with them. It is not uncommon for the introduction of the two (Shinigami and Zanpakutō spirit) to take place in theinner world while the prospective Shinigami sleeps. A Zanpakutō is generated by its wielder upon the solidification of their Reiryoku into the sword’s form. It is not enough to simply know the name of one’s Zanpakutō. If a wielder were to lend its power to its Zanpakutō then the weapon would become stronger. To fully use a Zanpakutō’s power, a wielder must get to know its Zanpakutō’s spirit. 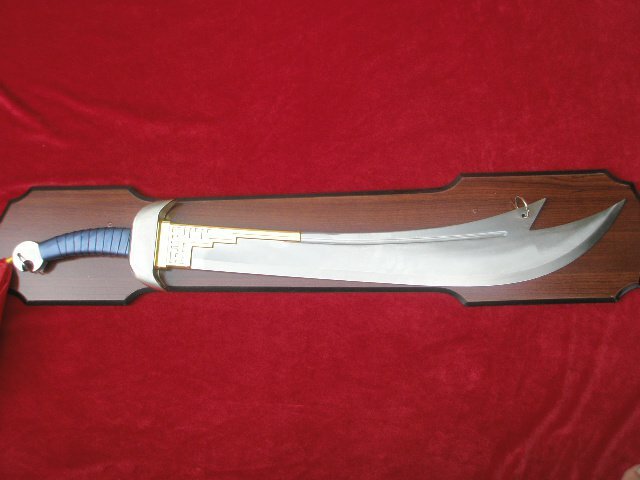 Sting was an Elvish long knife made in Gondolin during the First Age. Sting was an ancient blade and was lost during the Fall of Gondolin, the same battle in which Turgon fell and Glamdring was taken. The blade was carried by Bilbo in The Hobbit after he found it in a Troll-hoard. Sting was found alongside Glamdring and Orcrist. Though just a knife by the standard of elves, it made a perfect short sword for a Hobbit. 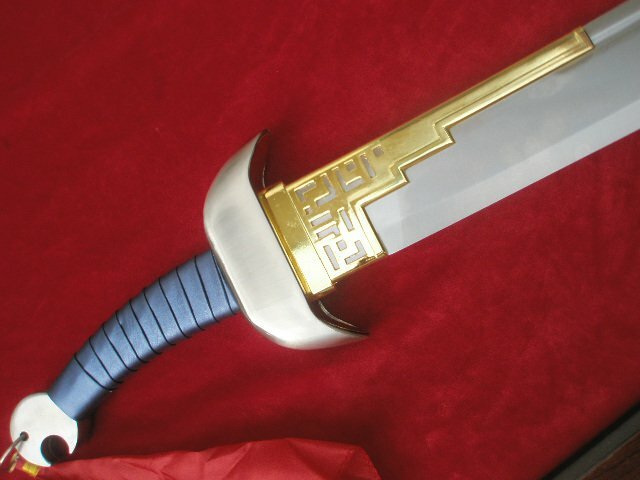 A typical Gondolin weapon, it glowed blue whenever Orcs/Goblins were close by. It was christened Sting by the spiders of Mirkwood Forest, many of whom were “stung” by Bilbo with it. Just before his nephew left on his quest to Mordor, Bilbo gave Sting to Frodo.Sam then took the weapon from his (seemingly dead) master and used it to good effect against Shelob on the borders of Mordor. After the defeat of Sauronat the end of the Third Age, Frodo entrusted Sting to Sam and it became an heirloom of the Gamgee family. Gollum, who disliked anything made by the elves, was afraid of Sting. This fear aided Bilbo when he confronted Gollum in a cave at the base of the Misty Mountains in The Hobbit (the book). It also helped Frodo and Sam subdue Gollum in The Lord of the Rings. Orcs also had an instinctive fear of these weapons and hated any who carried them. As is fitting for a blade of Gondolin, Sting could easily cut through the webs of the offspring of Ungoliant, including the spiders of Mirkwood and the evil Shelob herself. 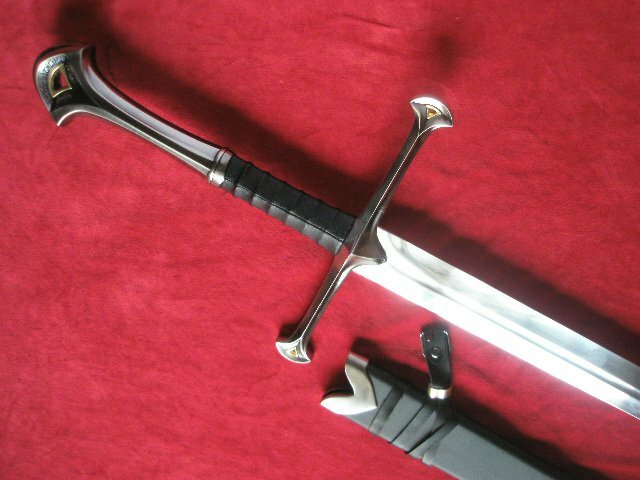 In TA 3019 the sword Narsil was reforged in Rivendell as Andúril also known as Sword that was Broken and Sword Reforged for Aragorn, the Heir of Isildur, and rightful King of Gondor. Aragorn carried the sword during his journey south as part of the Fellowship of the Ring, and it featured prominently at several points in the story, where it was sometimes referred to as the Sword that was Broken or The Sword Reforged. Aragorn uses it as evidence of his heritage when he, Legolas, and Gimli first meet Éomer. He reluctantly sets it aside before meeting Théoden; telling Háma, that death will come to any man except himself who draws it from its scabbard. 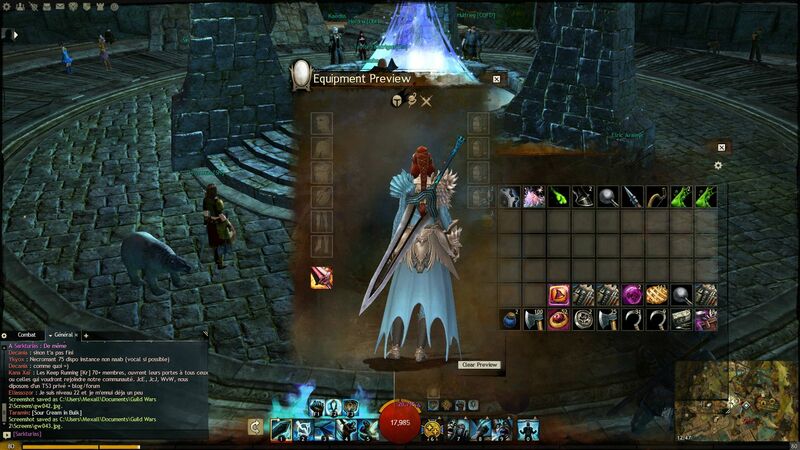 The Elves of Lothlórien made a scabbard specifically for this sword. It was overlaid with a tracery of flowers and leaves and elven runes spelling out the name of the sword and its lineage. There was an enchantment upon the scabbard so that the blade that was drawn from it would not be stained or broken, even in defeat. It is likely that Aragorn could have killed the Nazgul with Anduril, even though he was a man, due to the sword’s use in cutting the ring of Sauron’s finger. Update: It seems like the recipes with scrolls are exotic weapons or armors. This means you can get an exotic weapon for 50 skill points, mystic coins, and some mats. We should figure out what exotic weapons each recipe gets so people can get the exotic they want. Also, probably some of these recipes are for legendary weapons precursors, and we should find out which ones they are. 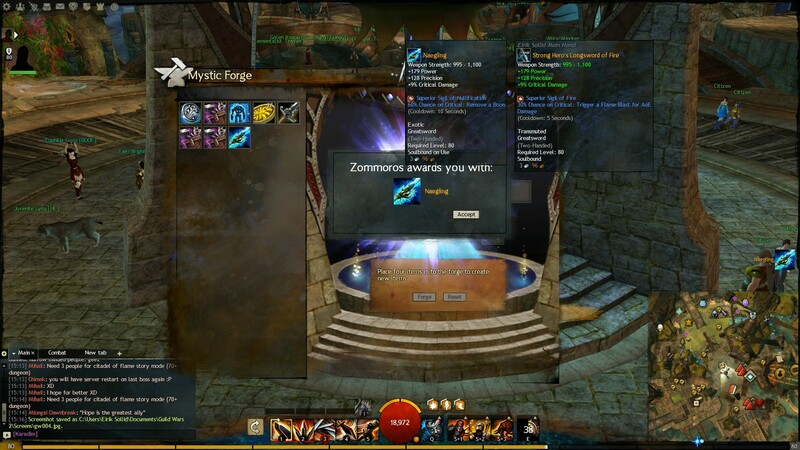 I’m pretty sure a lot of people have figured out Mystic Forge recipes, but are just hording the information to make profit, so I’m trying to share what I know and aggregate info from the community. Set recipes that give you the same thing each time. A lot of these are level 80 exotics weapons/armor. I’m pretty sure each recipe with a scroll gives an 80 exotic. We just have to figure out which recipes give what. Wine = Elonian Wine – 25.6 silver from Miyani. 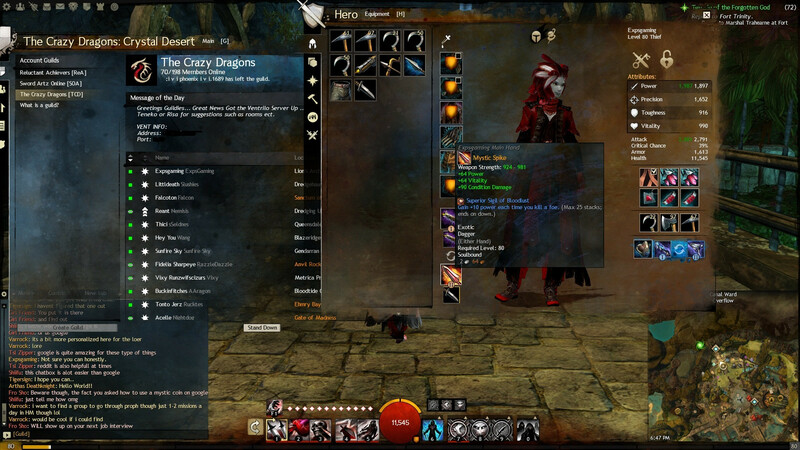 When I refer to fine crafting materials like bones, I mean the tier 6 version (e.g. Ancient Bones). Anything lower won’t work, but you can transmute lower tiers up using philosopher stones. 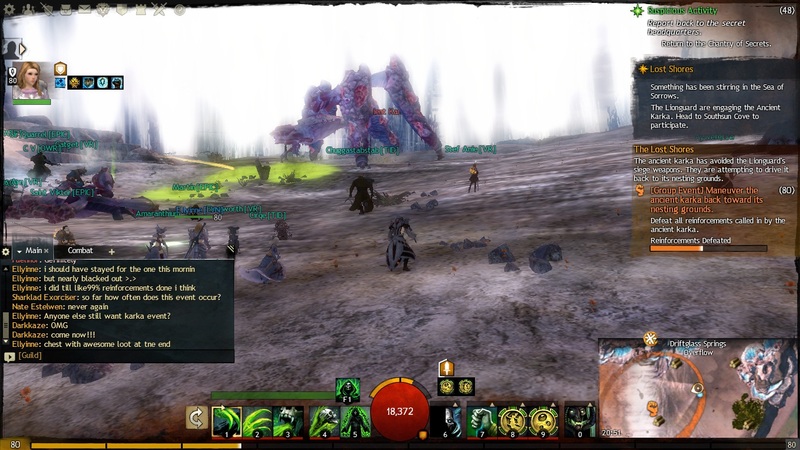 Check the wiki http://wiki.guildwars2.com/wiki/Mystic_Forge. This will tell you how to turn copper or into iron ore and large bones into ancient bones, for example. Some people are having trouble, so here’s a more thorough explanation. 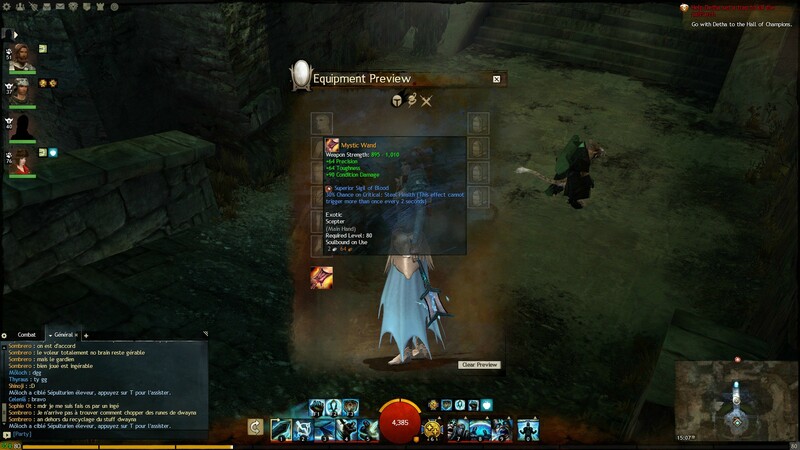 Go to http://www.gw2db.com/ and then go to recipes for the craft that makes the weapon you want. 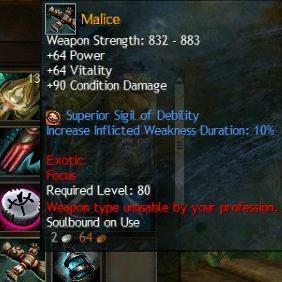 Then click on one of the pearl weapons of the type you want (the affix doesn’t matter, so Berserker’s or Carrion or any of those is fine). Now look at the ingredients of that recipe. One will be an inscription, and the other two will be the components you want. 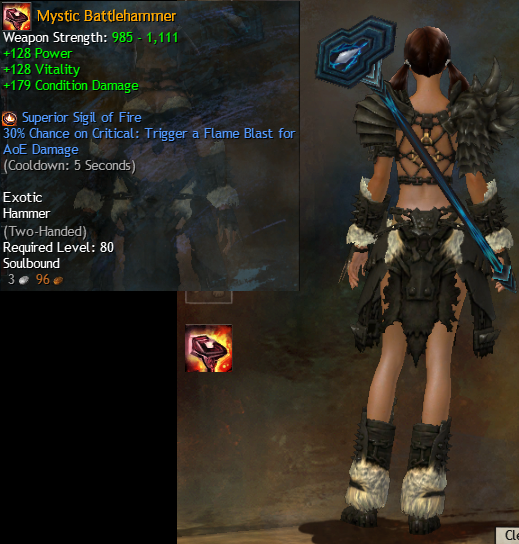 See the bottom for a gallery of Mystic weapons and their stats that I’ve collected so far. The stats are set and will always be the same. 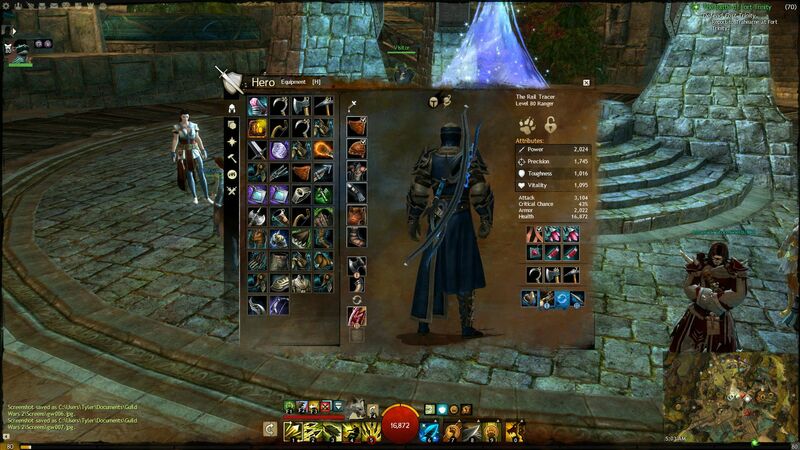 You can also check the PvP locker to preview them. 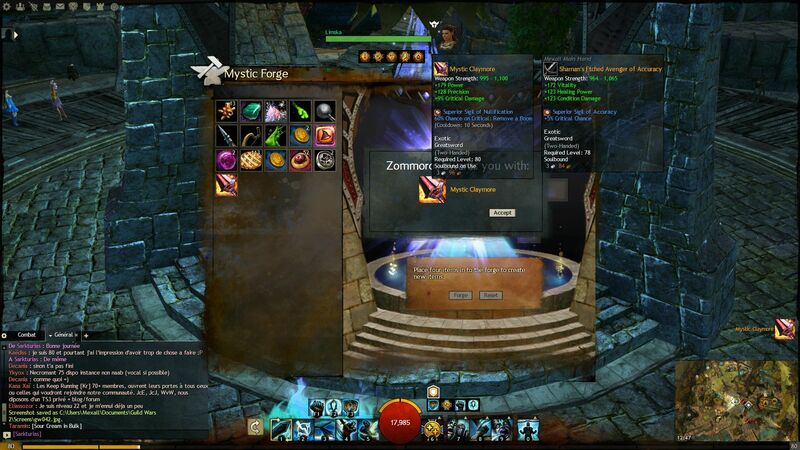 20-50 t6 fine materials – Output amount is currently undergoing research, may not be 20-50 – Discovered by Magister GrennEU. Also received reports that this makes mystic clovers, but that may be inaccurate. 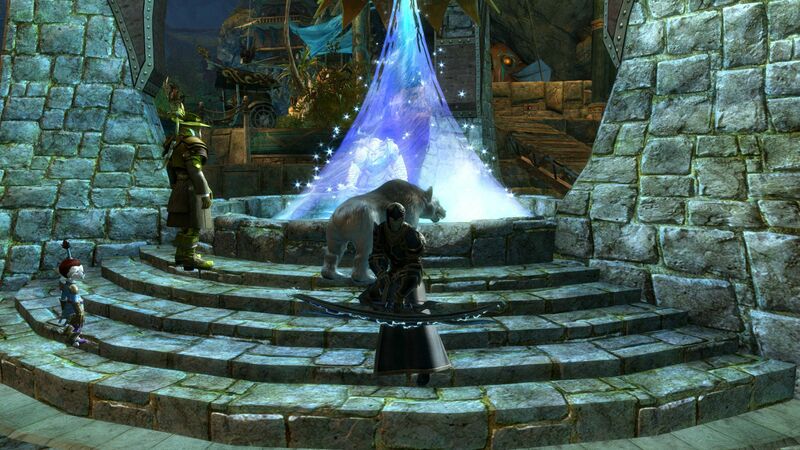 You get the Obsidian Shards from the Karma vendor after you complete temple of Balthazar in Straits of Devestation. Scroll + Ecto + Crystal + ? Scroll + Ecto + Philo Stone + ? Scroll + Coins + ruby orb + ? Bloodstone Shard + Obsidian Shard + Gift of Exploration + ? 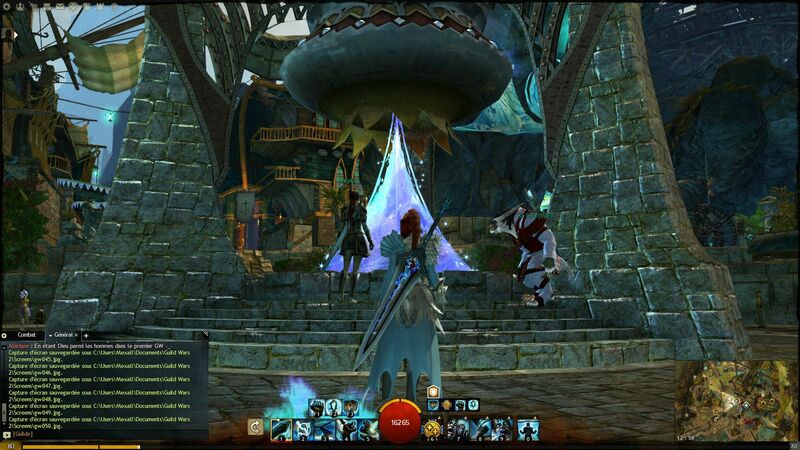 There are also probably recipes using the other lodestones, but I ran out of money and couldn’t buy them to find out. Let’s work together as a community and chart this unexplored territory! I’m pretty sure some of these recipes at least give you the exotic components for legendaries. If the reddit community can band together and chart new territory, then I think that would be awesome! To the best of my knowledge the results of these recipes isn’t available publicly anywhere. 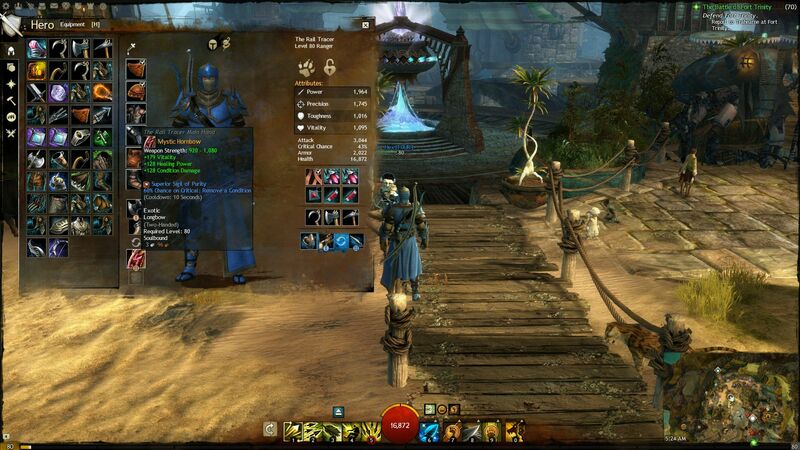 Guild Wars 2 Legendary Guide. 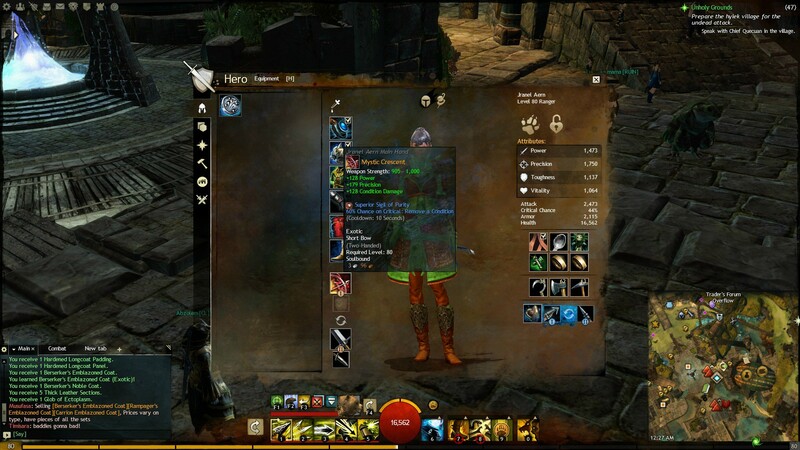 To my Guild Wars 2 Comrades a guide to make your legendary!!!! There is a Villain Trailer for COD : Black Ops 2 LOL!!! So unexpected for this trailer. I’m always impressed by COD series trailer but this one definitely surprised me !! Its bringing out the soldier in me !!!! !